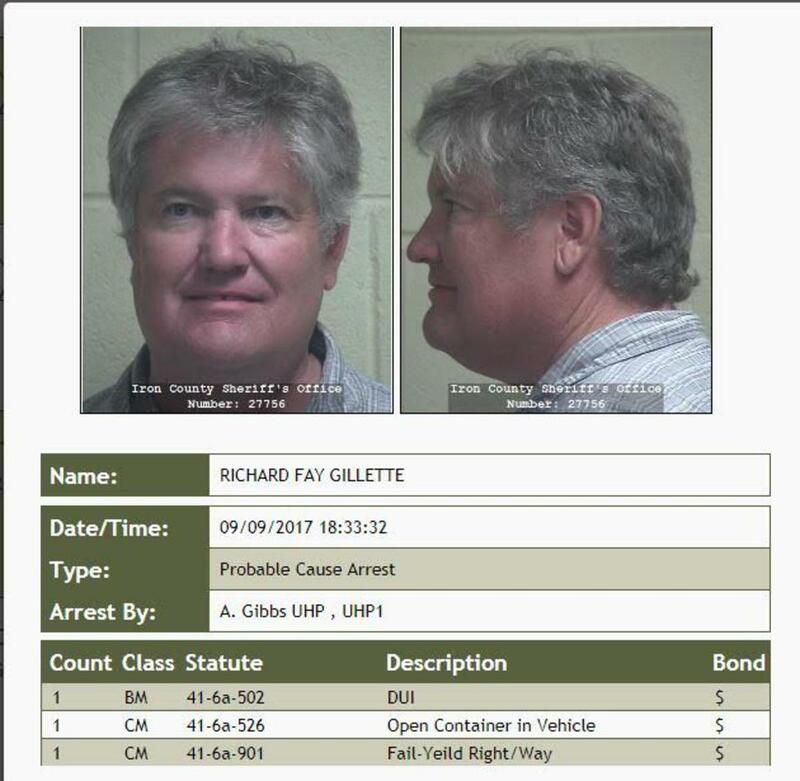 According to the Desert News the chairman of the Cedar City Planning Commission and candidate for City Council was arrested for investigation of DUI over the weekend. The iron County sheriff’s department booked Richard Gillette (52) for driving under the influence and having an open container on Saturday September, 9th around 6:30 pm. According to the Utah Highway Patrol’s test Gillette had a blood alcohol content of 0.298% almost four times the legal limit of 0.08%. According to the The Spectrum ( St. George’s newspaper) Gillette explained that he had been drinking with friends at the Great American Stampede Rodeo at the Cross Hollow Events Center in Cedar City Saturday evening. “This kind of thing happens to people once in awhile,” he explained. Gillette is also running for a spot on the Cedar City Council and says that this DUI arrest will not affect his campaign and that he still go forward with his candidacy. He was able to secure the final spot on the general election ballot after he received nine percent of the vote in last month’s primary vote. The general election will take place on November, 7th. A DUI with such a high BAC level of 0.298 % carries a much higher penalty than a normal DUI in Salt Lake City, Tooele, Cedar City, and throughout the entire state of Utah. Call Greg S. Law at 801-261-6228 local or 888-784-3554 toll free.If you have questions about your rights following a recent DUI arrest, DUI penalties or how we can help, call or contact Greg S. Law in Salt Lake City, Utah, online. We offer a free initial consultation with a lawyer, and are available for evening and weekend appointments. We also accept major credit cards for your convenience.